Katie Melua might have said there are 9 million bicycles in Beijing, but we’re more interested in the (apparently) 110,000 dogs in Berlin. After our trip to the German capital last week, there were nearly 109,999. Alas, we restrained, and came back with nothing but start-ups from our trip to the start-up juggernaut, Berlin! Undoubtedly one of Europe’s most prospering hubs, Berlin is home to over 2500 start-ups, with a new one founded every 20 minutes. Snooze and you’ll miss them! Berlin success stories abound; Soundcloud, HelloFresh, Dubsmash and Delivery Hero to name a very small few, and all the biggest of corporates are here too: Google, Amazon, Facebook, Airbnb and General Assembly. We spent our time in Berlin meeting with the big co-working spaces and incubators like Techstars, Openers, TechOpenAir and Betahaus, and sensed the burning competition in the air when it came to these communal working environments: who had the coolest architecture? Who could offer the best perks? Who had the cutest puppies? Honestly, we can’t stress enough how much Berlin techies adore their pooches! We loved our visit to The Family, where Stéphanie presented OneRagtime to ESCP Berlin students and gave advice on how to build your start-up. We were extremely impressed by the number of company builders Berlin boasts, such as B10, WattX and Rheingau Founders, who give a lot a freedom to the entrepreneurs in their communities. And if that wasn’t enough, we organised a meet-up and pitch competition at Smart Recruiters. Our two winners were Penta and Poissonnerie.com, who will be joining us in Paris on 7th December for our annual pitch competition. Find out more here. It’s well documented just how much cheaper Berlin is than many of its European counterparts. Office overheads and the price of living are significantly cheaper than rivals London and Paris, giving those entrepreneurs with lighter wallets a chance to build when they might not have been able to afford to elsewhere. Lower costs, lower risks. This financial breathing space creates a gutsy entrepreneurial atmosphere: with less money on the line, start-ups can embrace greater risks. This fearless innovation can only be a good thing. Germany’s reputation as a nation of well-organised, punctual and systematic people rings true in start-up successes like Babbel, the language learning app. Babbel’s growth has been deliberately steady, scaling sustainably with small funding rounds and an emphasis on the importance of achieving a workable model before expanding. Now, with 450 employees, they have raised $32 million in total funding. As with all hubs though, Berlin has its flaws. Critics look to Rocket Internet’s model (of incubating imitation start-ups of successful business models) as symptomatic of what’s missing in Berlin; that rational and reliable Germans choose to copy profitable ideas rather than innovate themselves. Secondly, there is concrete evidence of a real gender imbalance in the ecosystem. A mere 9% of Berlin technology start-ups were founded by women, far less than in Europe overall (17%), and in American hubs like Silicon Valley (24%) and New York (16%). And without wanting to put a dampener on things – Berlin’s airports really could do with a facelift, and more direct international flights. One thing that did surprise us, was that Berlin’s start-ups tend to innovate in ways that are more creative, rather than exclusively tech-focused. With the exception of blockchain technology, we found Munich to be the more passionate centre for German technology innovation. See our thoughts on Munich here. This creativity brings about great things, however. An international, unorthodox crowd of young talent, with a very open-minded culture – 43% of start-ups were founded by immigrants in 2016. And the funding is there to back them, according to Ernst & Young, Berlin start-ups raised €2.4 billion in venture capital funding in 2015, more than London or Stockholm. Combined with Berlin’s top flight engineering and business universities, there is a heady mix ripe for innovation. What’s most important about all of this? 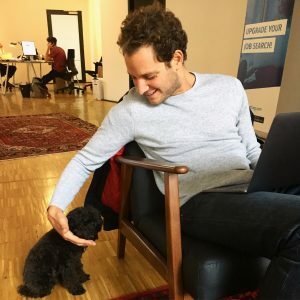 Berlin’s start-up dynamic is not yet scaled-up – the next Rocket Internet is waiting in the wings to take Berlin, Europe and the world by storm. Who’ll be next on Germany’s start-up throne? Follow our #startuphunt2017 on Instagram, Facebook, Linkedin and Twitter.